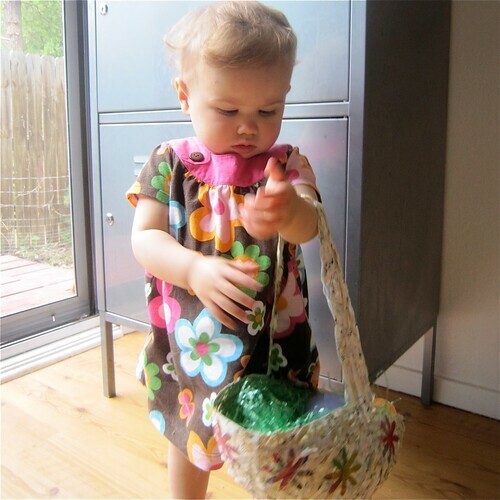 Though this is not Tallulah’s 1st Easter, it will be the first one that she can carry a basket. That being the case I made it my life quest to try and make her a custom Easter Basket. Gather up some Collage Pauge, balloons and scraps of paper today for I Love to Create and make your own. You might remember my Eco-Friendly Ping Pong Necklace how-to from last year and recall that I love working with shredded paper. Use colorful magazine pages for one look or black and white sheet music or newspaper for another option. If you don’t have a shredder, never fear. 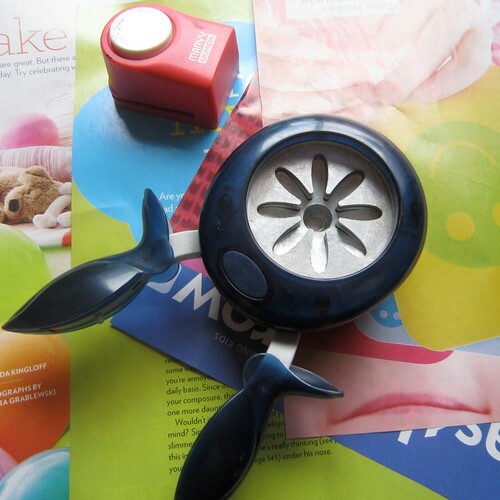 Use scissors to cut strips or do it old school and hand shred the paper. Either way you are going to need a large pile of shredded paper. 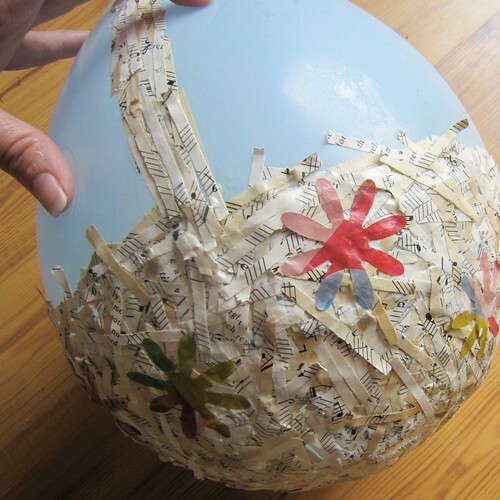 Using Collage Pauge cover half of your balloon with several layers of paper. Feel free to make a nice smooth top edge now or you can go back after the paper dries and hardens to do it with scissors like I did. 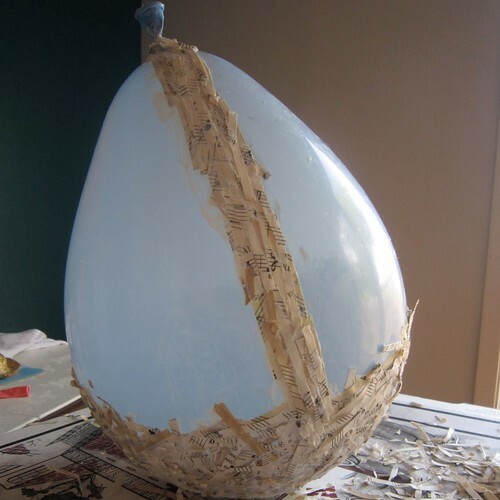 Also using Collage Pauge and paper create a handle for your basket going over the top half of the balloon. Allow basket to dry completely. Feel free to go in an add decorations to your basket: polka dots, flowers, pictures from magazines. Once your basket is completely dry, pop your balloon. Your basket is born! 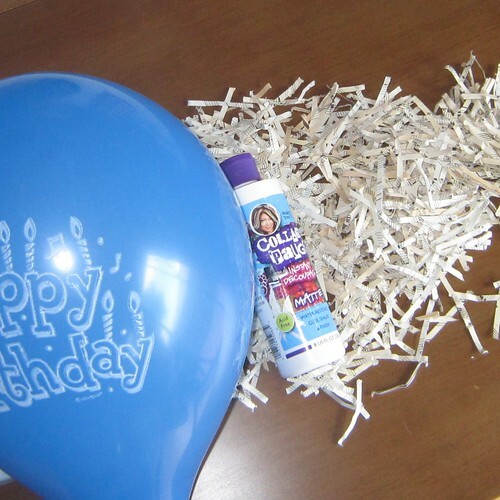 Coat your balloon in Crafty Chica Glossy Gloss Varnish or Paper Glaze to help prevent any tackiness. You never know when dew can strike early on an Easter morn! 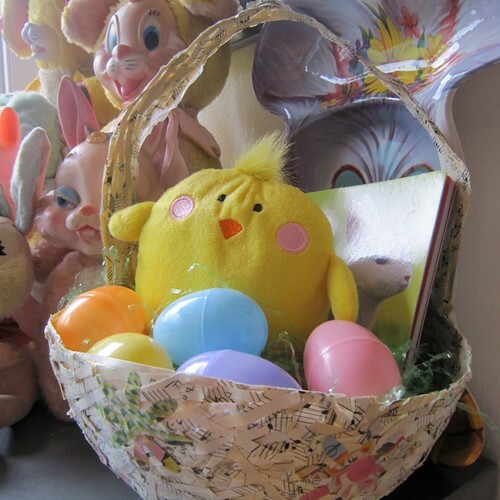 All that is left to do is hide a few Easter Eggs and let your kiddo fill their basket! Don’t forget to make a pair of Egg Shell Mosaic Earrings with those left over dyed Easter egg shells. 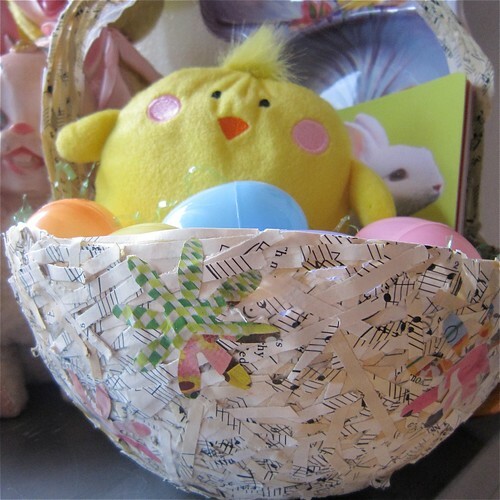 Posted April 1, 2010 & filed under Easter, Eco Craft, I Love to Create. I love it! Great pics too! I'm mad for those Fiskars punches. Jen you are a really, really super mommy. Tallulah is one lucky little girl. Great basket, Jen! Man, now I'm feeling like a basket slacker. Better get to work! This is so cute! Love the basket! 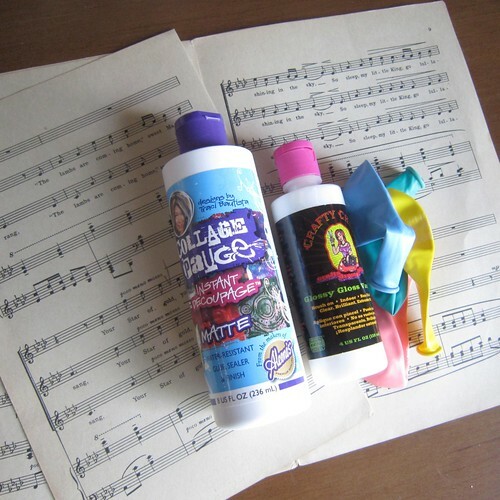 Great idea and I happen to have modpodge handy! Angela sent me over from Fiskateers.com. You really have a colorful blog and you take great pics! When we were in school…we used to make face masks the same way! ofcourse i didn’t any of these nice products…we used to make the glue at home with rice powder..it becomes starch when u keep boiling it..and let it cool and becomes glue! The photo of your daughter with her basket is so sweet. Such a great kid project. Very precious! I tried, but I have to say that you have much much more patience for this project than I. LOL. another creative masterpiece from the naughty secretary! just in time for easter..i lurve it! Love this! I want to do this with my sped class. Any idea how much mod pauge will be needed for 6 baskets?